I just got home from an exciting day of hosting two live cooking shows at the New York Botanical Garden where I showed two audiences how to prepare different recipes featuring delicious, in-season beets. It was the first time I ever cooked before an audience, and I think it went pretty well! P.S. I realize this cake is a little unusual, but it's delicious; everyone in the audience tasted it and liked it (some were clamoring for 2nd and 3rd pieces!). Grease a bundt pan and dust with cocoa powder tapping out the excess (or spray with cooking oil spray w/ flour). Preheat the oven to 375 degrees. 1. In a large bowl, combine the flour, cocoa powder, cinnamon, baking soda, salt and sift until evenly distributed. Set aside. 2. Cream 3/4 cup butter and the sugar in the base of a standing mixer until light and fluffy. Add the eggs in one at a time and let beat for 3-4 minutes until doubled in volume. 3. While the egg mixture beats, combine the chocolate with the remaining butter and microwave 20 seconds at a time, stirring each time, until melted. Stir until smooth and set aside. 4. Add the vanilla extract to the eggs, followed by the espresso, chocolate, and the beet puree and mix until well combined. 5. Add the flour mixture to the beet mixture and mix just until completely and evenly combined. 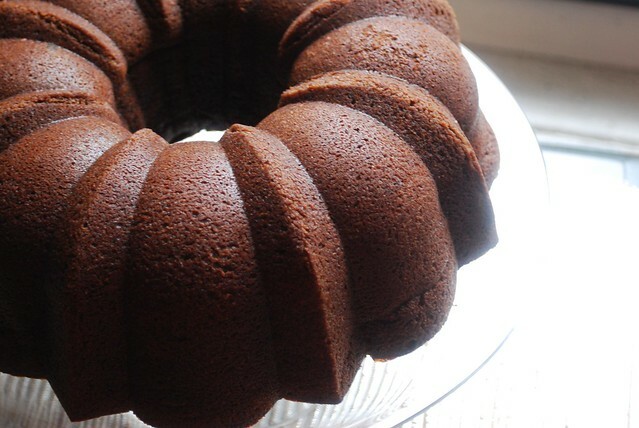 Pour the batter into the prepared bundt pan with the batter angled so that it is an inch higher on the sides than in the center, and bake at 375 degrees F for about 50 minutes or until a tester inserted near the center comes out clean. Cool in the pan for 15 minutes before inverting on a wire rack. 6. 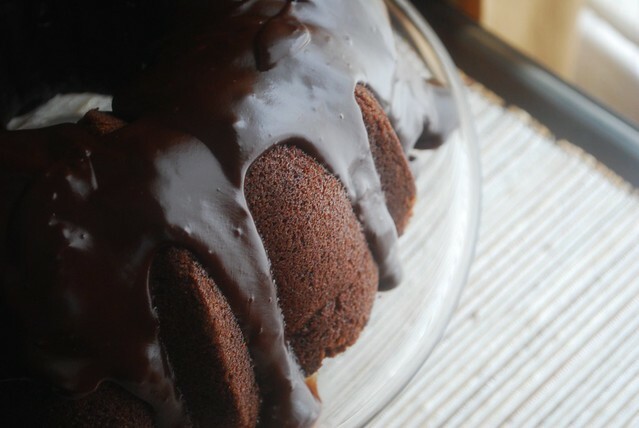 While the cake is cooling, make the ganache by combining the chocolate and butter in a medium bowl. Heat the cream through gently just until it starts to bubble and pour over the chocolate. Stir slowly until the chocolate melts and the ganache becomes smooth and glossy. 7. Pour the ganache over the cooled cake and let set 15-20 minutes before serving.